Sometimes for one reason or another a baby animal cannot be raised by its mother. When this happens the livestock farmer or rancher will try to put that lamb on another mother, but if that is not possible, that baby then becomes a “bummer”. A bummer is fed several times a day by the livestock farmer or rancher; it will drink milk replacement via a bottle until it becomes big enough to eat solid foods. Naturally, you hope these bummers will grow and flourish. Usually, they don’t grow as well as their counterparts, they can get pot bellies, and they are generally not retained in the herd/flock as a replacement (if they are female). Last winter (2013) I posted about my Mom feeding a bummer lamb here. When I was home for Christmas (2014) my Mom pointed out one of her replacement ewes to me. She said that this ewe was the bummer lamb that I wrote about last year. That little lamb had grown up and had become a nice little replacement ewe. Good quality feed and genetics can sure make a difference on a bummer joining the flock! 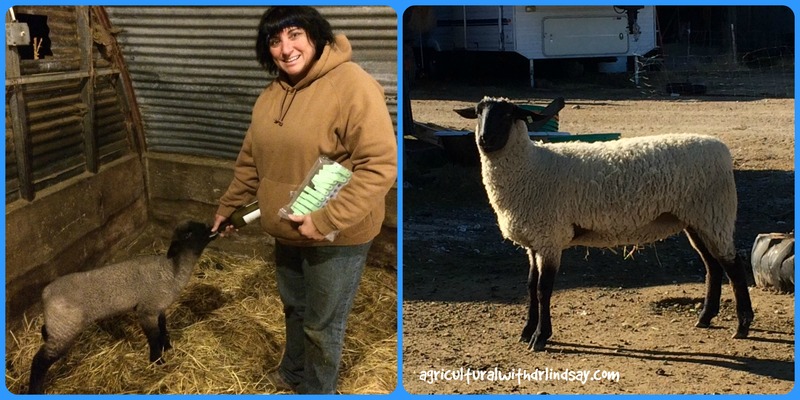 A bummer lamb to a replacement ewe: A success story! Previous Genetically Engineered (GE) Animals: Benefits to human health? Next What’s all the buzz with BEES?… What do you want to know about BEES?